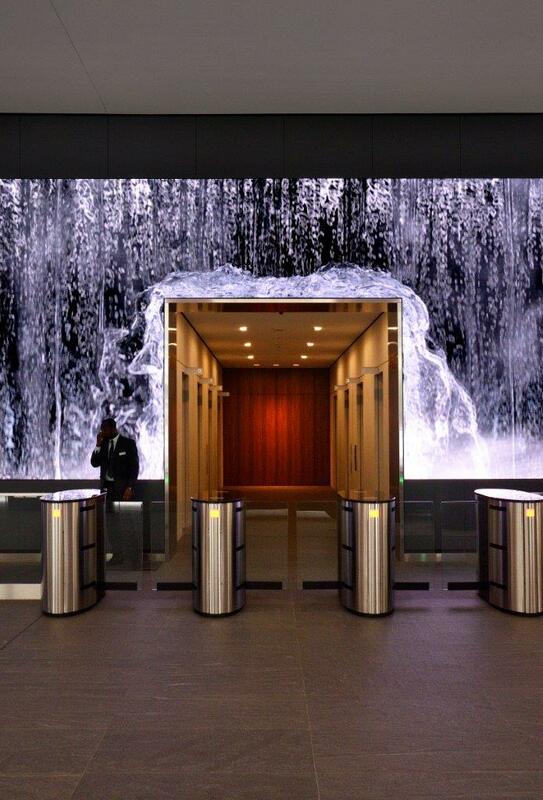 The waterfall content and other real-life content created by Obscura Digital is still stunning viewers, both in person and online. 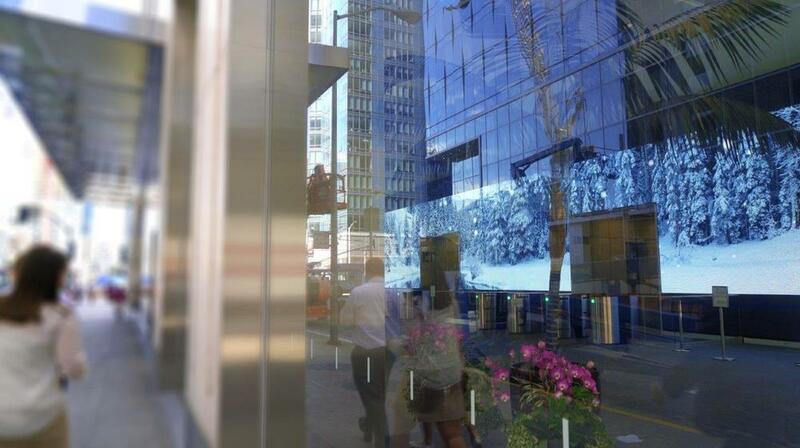 50 Fremont Street, San Francisco, CA. 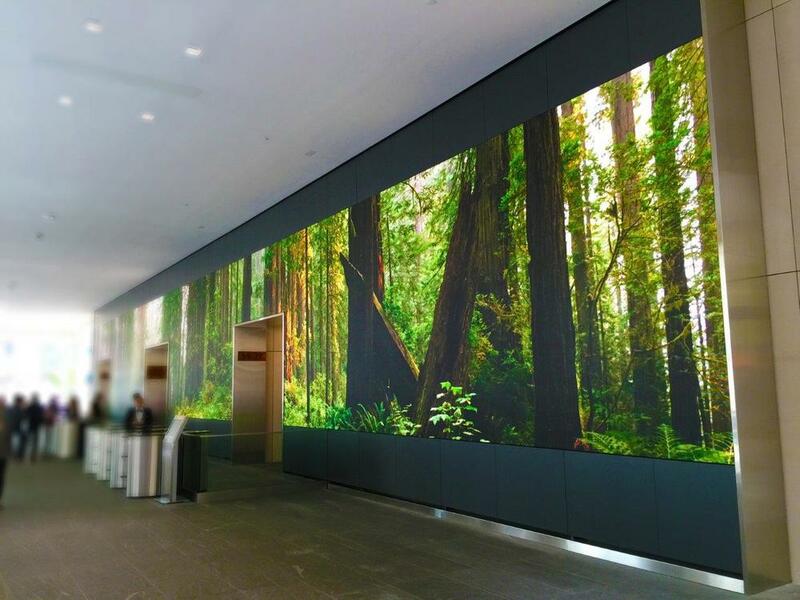 "From award to factory acceptance testing to delivery to install, SNA's project management team always kept us informed... After our experience, we would certainly recommend SNA for any company's LED media needs." 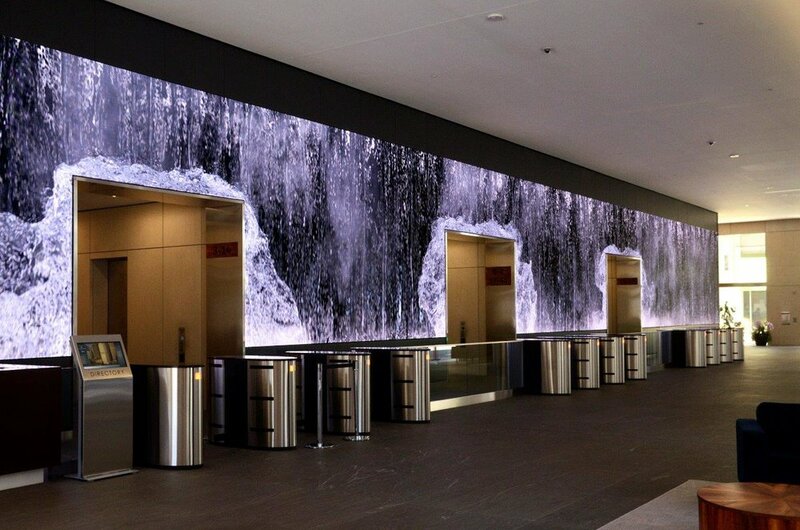 "Despite the tensions that inevitably come with retrofits and new building construction, we were put at ease by SNA's experience, know-how and ultimately results with regard to the LED technology they supplied." 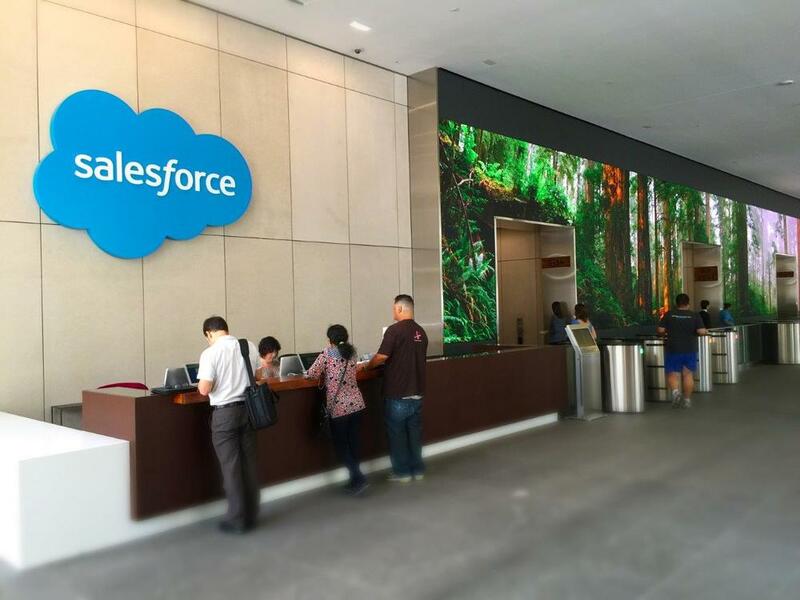 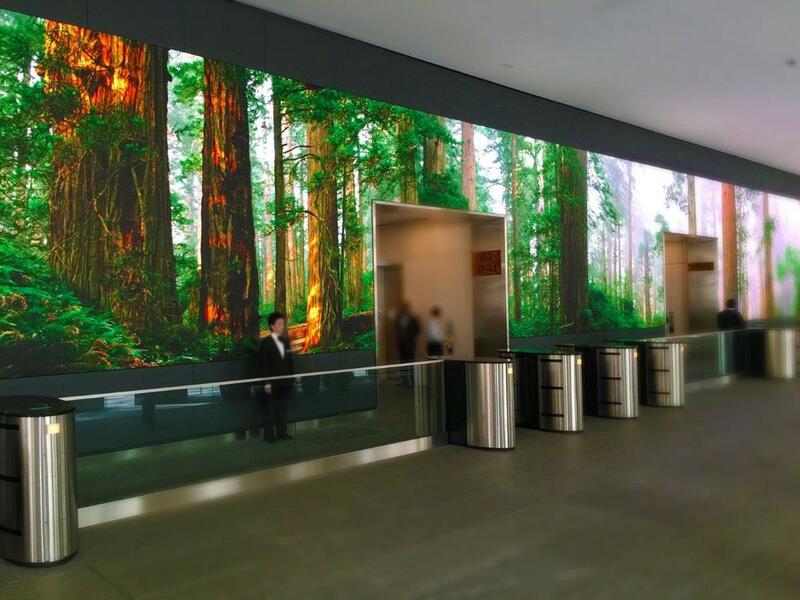 SNA Displays Installs Longest 4 mm LED Wall in U.S.
Sansi North America (SNA) Displays completed installation of a 106-feet-long 4 mm LED video display at the newly expanded Salesforce headquarters at 50 Fremont Street in San Francisco. 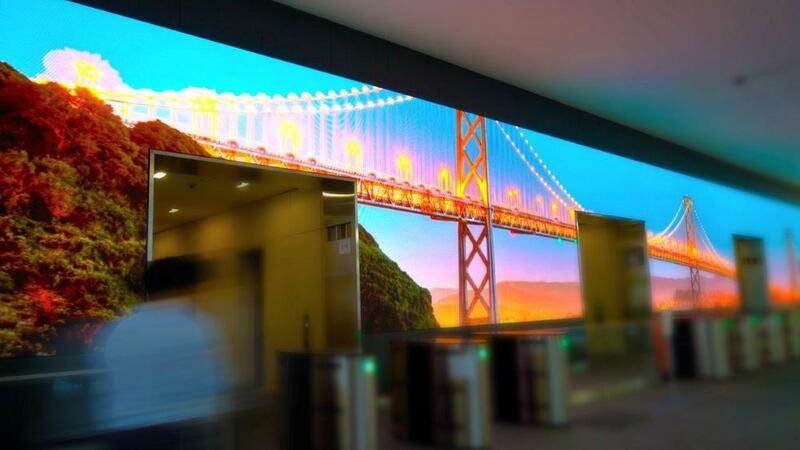 It is the longest continuous 4 mm LED screen in the United States. 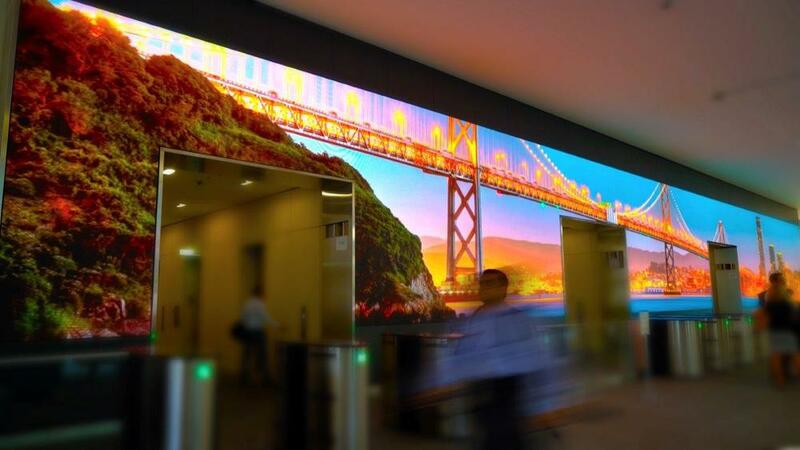 The display features a tight 4 mm pixel pitch, meaning the center of each pixel is only .16 inches from the center of an adjacent pixel. 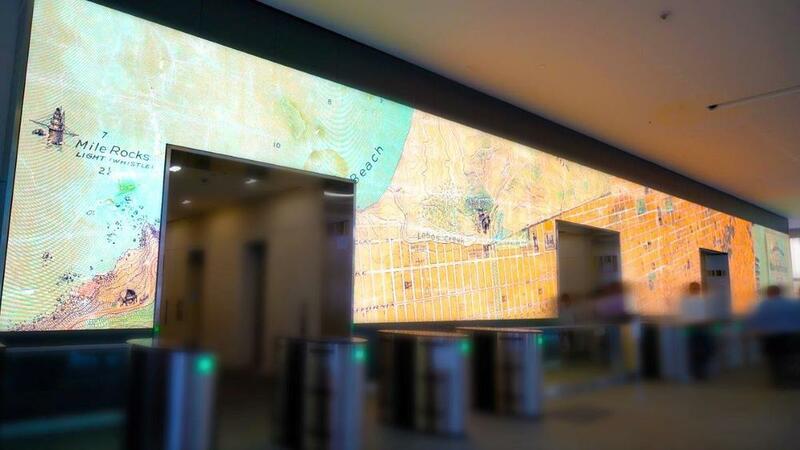 The video wall is approximately 12'7" high by 106'5" wide with a resolution of 960 x 8,112 pixels. 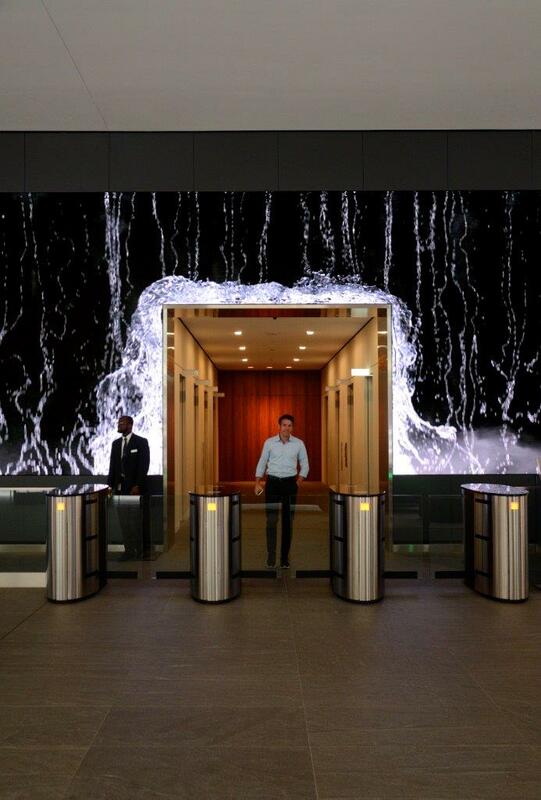 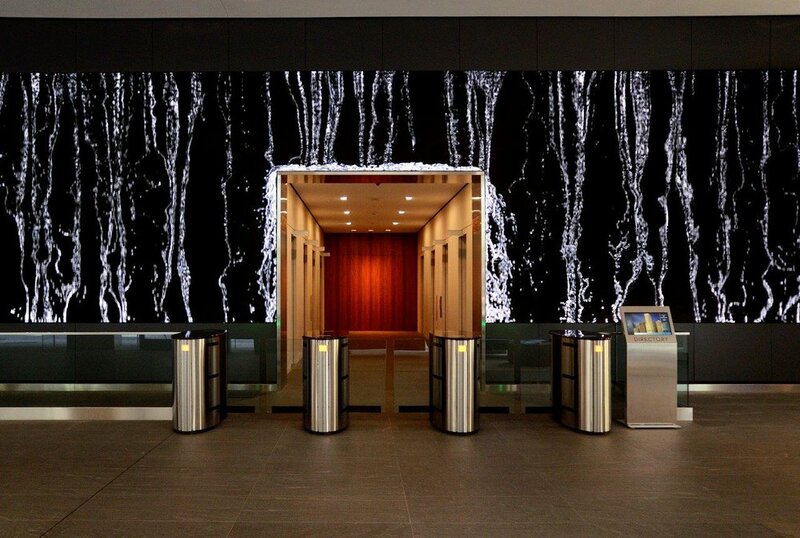 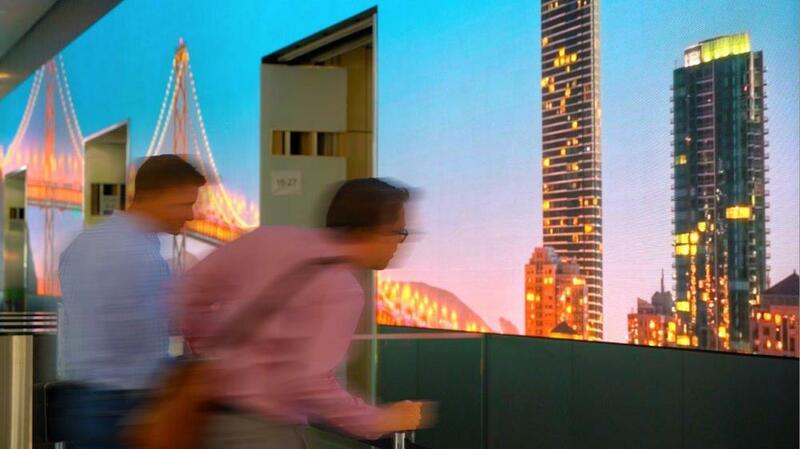 Accounting for the elevator entrance cutouts, the display consists of more than seven million pixels, comparable to many LED spectaculars like those found in Times Square. 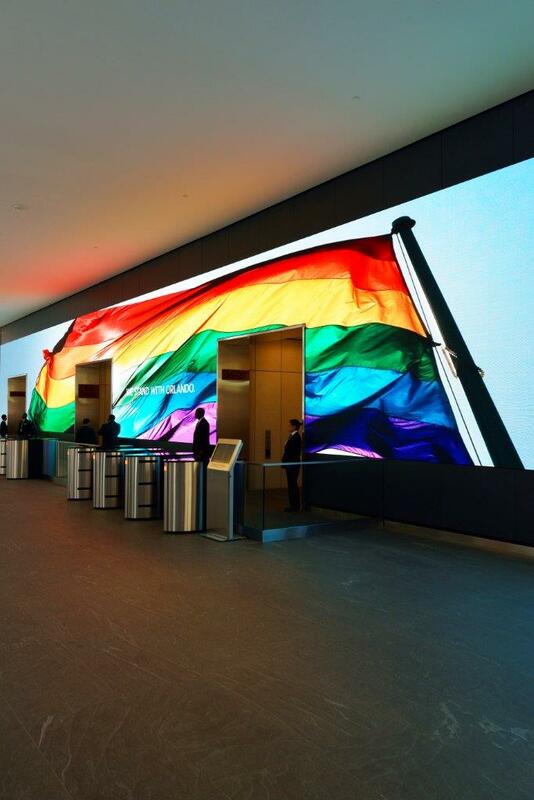 The indoor S|Video™ LED display employs high-end, surface-mount device (SMD) technology, where each pixel's LEDs are packaged together, allowing for crisp, clear imagery and a widened viewing experience. 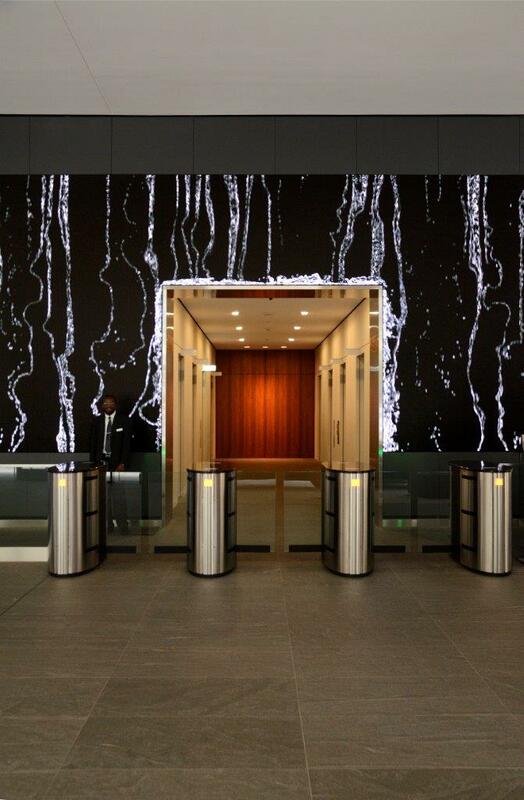 The project's design architect was Gensler. 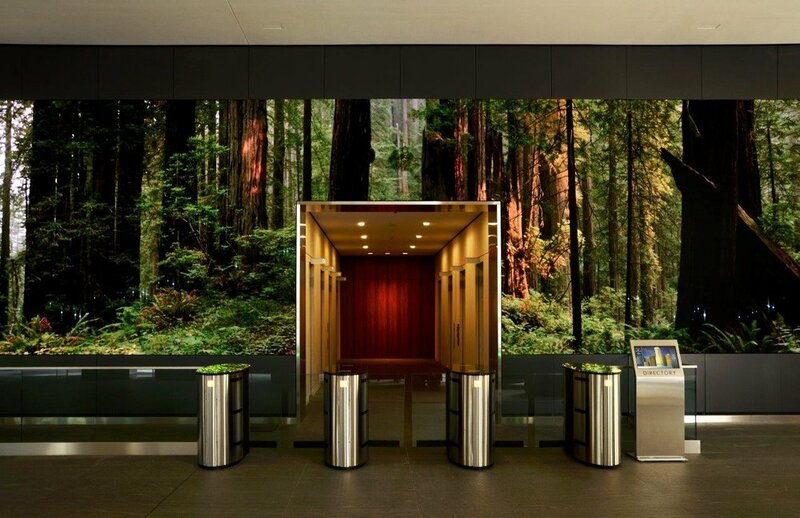 In addition to the retrofit nature of the project, one of the critical elements to the design was properly positioning the screen technology around the elevator entrances. 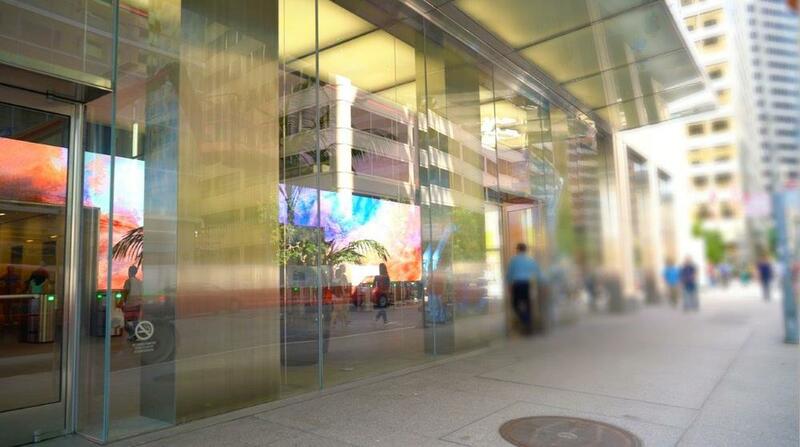 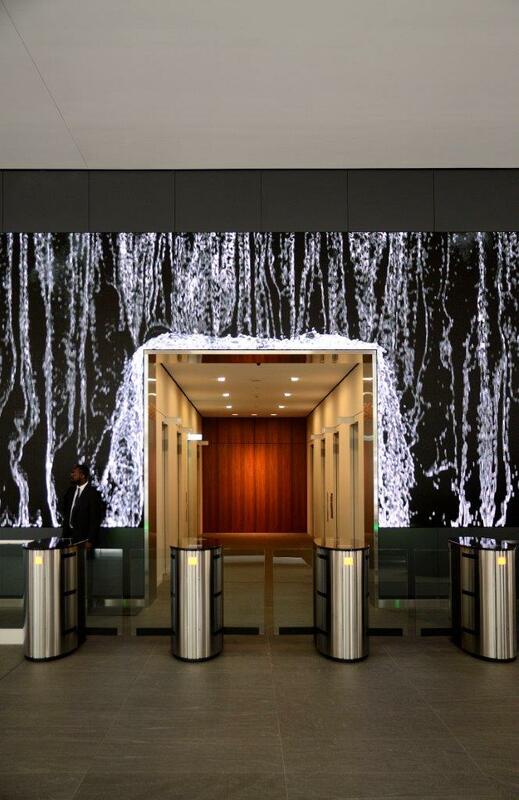 This allows the video wall to become an important part of the lobby architecture without being intrusive.